According to Pew Research Center’s latest State of the News Media study, the newspaper industry might not be as doomed as we all think. When crunching numbers on the many different types of news media, (like digital, local TV, cable TV, etc.) 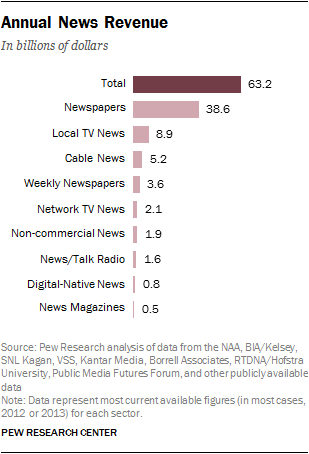 Pew found that newspapers brought in $38.6 billion in revenue, about 60 percent of the total news revenue of $63.2 billion. Newspapers didn’t just grab the top slot, they dominated. No other media was even close. In fact, no other media came close to $10 billion. The runner-up was local TV news, with only $8.9 billion. About $25 billion of newspapers’ revenue comes from advertising, and $10 billion comes from print and digital subscriptions.